personal friends and with Kevin & Guch, my very special friends. How do I describe one favorite event from all of those trips? For me it is not about my individual experiences of catching king salmon over 50#s or 100+# halibut on salmon gear or we have six silvers on at the same time ( I think we call that Donkey Kong), giant lings off the Pinnacles or those days when it is raining sideways and you have to hang on with one hand while you fish and the bites are few and far between. The Orca pods, Grey whales and the sea birds all add to the experience. For me it is about the place and the experience. 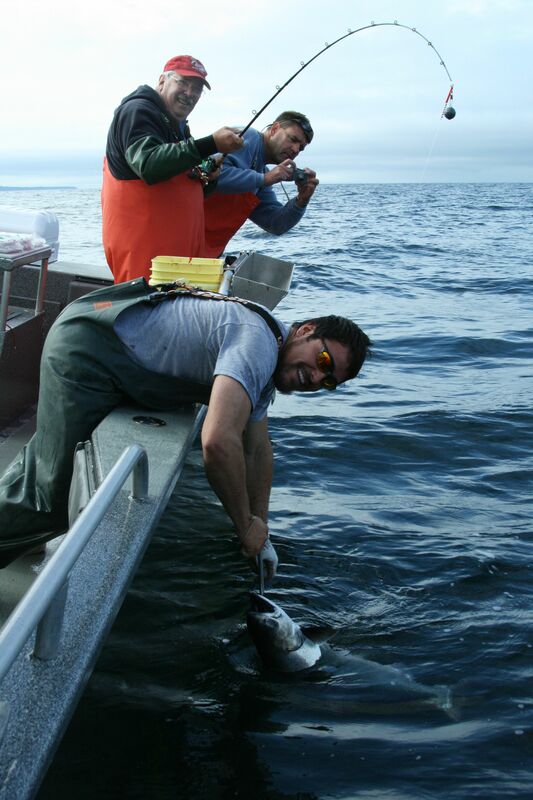 Fishing Sitka with IslandView is the highlight of my year. When the plane leaves the Sitka runway, I am already dreaming about next year. We all know how beautiful Sitka is as the plane approaches the runway. The magnificent mountains, blue water in the sound, and the islands shining like jewels. The plane has many of my fishing partners on board, some that I only see on this trip, the first week in August. Cocktail hour in the lodge gives us a chance to catch up and relive past trips and explain to the “newbie’s” how the program works and what to expect during the next three days. If they are lucky they may see the rare flock of Sitka Pink Flamingos. It will blow their fuses. The views of Mt Edgecumbe are spectacular as we watch the sun set over the sound. We set the alarms for 4 A.M. and go to bed with anticipation. have our boat assignments, hugs for the old hands and meet the new ones. Head north through Olga & Neva Straits with the mountains dropping directly to the water. We pass through the cut between Sinitsin and Kruzof Islands and out into Salisbury Sound and you feel the swell of the Gulf of Alaska as you pass the shark hole and the wash rock and turn south around the point. Georgiana is off our starboard side and the sea lion haul out island on our port. The bowl is next and we continue on to Point Amelia and as the boat slows down all eyes are on sonar looking for those orange and red balls of bait. We all take our fishing stations and wait for the call to make the first cast and slowly lower your plug cut herring down to the bottom. You reel up a few turns and let the bait work and wait for the tell tale tap-tap-tap then reel up a few more turns, feel the bite and reel like crazy until you feel the weight of that first king of the trip as you set the hook. The king comes up and leaves the area and takes you around the boat three or four times as you play through your fishing partners gear. Finally you bring your prize to the net and the deckhand lifts a 25# king onto the deck. You welcome him aboard with tap of the gaff to the head. Life is good now. All is right with the world. You repeat this process for the next three days on kings, silvers, halibut, rockfish and lingcod. You fish hard and your arms feel like they are going to fall off. Hopefully you will return home with two fish boxes as your reward. The beauty of this special place and the opportunity to experience this with good friends and share with new friends is always in my thoughts. I will continue to come to Sitka every year as long as I’m able. I expect to have my ashes scattered up here. 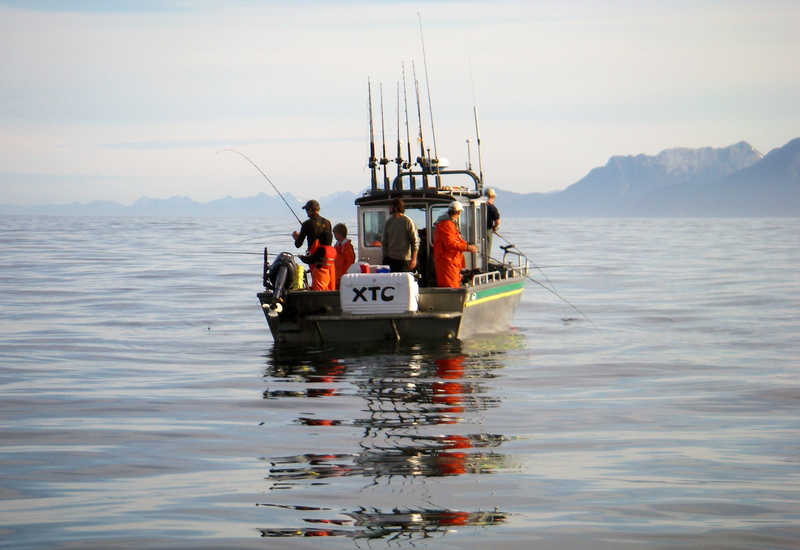 It’s all about the place, beautiful Sitka in Southeast Alaska and the lifetime fishing experience.